Orchestral Manoeuvres in the Dark (OMD) are an English new wave/synthpop group formed in 1978, whose founding members, Andy McCluskey (vocals, bass guitar) and Paul Humphreys (keyboards, vocals), are originally from the Wirral Peninsula, North West England. While steadily eschewing pop star status, the band cultivated a fanbase in the United Kingdom from 1978�1980. They gained popularity throughout Europe with the 1980 single "Enola Gay", and achieved broader recognition via album Architecture & Morality (1981) and its singles. 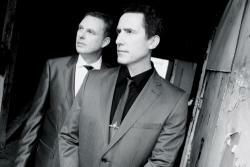 OMD also garnered acclaim for their experimental recordings. Although retrospectively lauded, their album Dazzle Ships (1983) eroded European consumer interest during the mid 1980s; Junk Culture (1984) marked a shift toward more pop-oriented songwriting. Concurrently, OMD reached their peak in the United States and had a major hit with 1986's "If You Leave", written for the film Pretty in Pink. Humphreys departed in 1989 with Martin Cooper (various instruments) and Malcolm Holmes(drums) to form The Listening Pool, leaving McCluskey to lead the outfit; Sugar Tax (1991) and its initial singles were sizeable hits in Europe. By the mid 1990s, however, synthpop had become unfashionable amid the guitar oriented musical climate, and McCluskey dissolved the band in 1996, months after their last successful single, "Walking on the Milky Way". He founded pop group Atomic Kitten in 1998. The band reformed in 2006 and began releasing new material in 2009. Their European fanbase remained steadfast: History of Modern (2010) became the group's biggest hit on the German chart; English Electric (2013) their largest in the UK since Sugar Tax. The group have sold over 40 million records. Despite limited mainstream support for their works, OMD have carved a unique legacy within popular music, being regarded by critics as the synthpop counterpart of The Beatles, and a pioneering and highly influential act. The Quietus magazine editor John Doran once remarked: "Orchestral Manoeuvres in the Dark are not one of the best synth bands ever: they are one of the best bands ever."